� Patterson led the AVP (along with Jake Gibb) with 13 wins from 2013-2016 (next most was five). � Patterson was one of just two AVP players (along with Phil Dalhausser) to rank in top five in hitting percentage in each of the four seasons from 2013-2016. 2018: Patterson formed a partnership with Stafford Slick, getting a best of third in their six AVP events together. Patterson was fourth on the Tour in hitting percentage (.486), was 10th in kills (6.24 per set) and tied for 10th in aces (.65 per set). Patterson and Slick played eight times on the FIVB Tour, with a best of a bronze medal in a three-star tournament. 2017: Patterson and Theo Brunner played five times on the AVP Tour, with a best of third twice. Patterson was ninth on the Tour in aces (.62 per set) and 10th in kills (6.65 per set). Patterson and Brunner played in nine FIVB tournaments, with a best of fourth in a four-star event. 2016: Patterson and Gibb were the top team on the AVP Tour, winning three times in their six events to go with a second-place and a third-place finish. Patterson led the Tour in kills (7.69 per set), ranked second in hitting percentage (.494), and sixth in aces (.65 per set). Internationally Patterson and Gibb played 13 times, including two fourths and six fifths leading up to the Rio Olympics, where the duo placed 19th. 2015: Patterson and Gibb won the first two AVP events of the season, extending their streak to five consecutive wins. Their match winning streak was halted at 27 in a row in their next event. In six AVP tournaments they advanced to the semifinals five times, and ended as the tour's second ranked team. Gibb finished the season fourth in kills per set (7.15), fifth in aces per set (.66) and fifth in hitting percentage (.453). On the FIVB Tour, Patterson and Gibb played in 10 events, winning one gold and one silver. 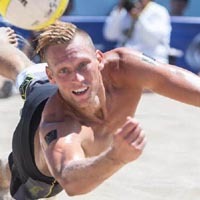 2014: Patterson continued his partnership with Gibb, and the duo began the AVP season with a second, a third, a win, and then a seventh place finish. They concluded the AVP season with three straight wins after winning 15 consecutive matches. The only team to win multiple titles, Patterson and Gibb ended the year as the top-ranked team. Patterson was second in kills (7.35 per game), third in aces (.77 per game) and fourth in hitting percentage (.453). On the FIVB Tour Gibb and Patterson played in 10 events, winning a bronze in Poland and placing fifth once. 2013: Patterson formed a partnership with Jake Gibb, and they won in just their second event together, an FIVB event in Shanghai. The duo advanced to four semifinals on the FIVB Tour, finishing once in each of the top four positions. They placed 17th in the World Championships and ended as the fourth-ranked team on tour and the highest U.S. team. On the AVP Tour Patterson and Gibb were the only team to advance to all seven semifinals and were the top-ranked team. They won four titles, all in consecutive events. They ended the year with a 30-5 match record which included a streak of 16 straight wins. Patterson led the tour in both kills per game (8.05) and hitting percentage (.475). 2012: Patterson played in both AVP events with Ryan Doherty with a best of fifth. The duo competed on two other domestic tours as well, winning three times in a total of nine events. 2011: Patterson formed a partnership with Brad Keenan, and played internationally for the first time. In two of their first three FIVB events, the pair advanced from the qualifier and finished ninth. In eight events the duo played in four main draws. Patterson played one FIVB event with Casey Jennings, finishing 17th. 2010: Patterson teamed up with Kevin Wong, and the duo advanced to the semifinals in their third tournament together, one of two third-place finishes on the year. In their last five events, their only losses came to teams seeded in the top four. They ended the year as the fifth-ranked team on the AVP Tour. 2009: Patterson formed a partnership with Ty Loomis, playing in 13 events together. In their sixth event together, in Brooklyn, they overcame a third round loss to win the title in what was the first final for both players. To win, Patterson and Loomis won four straight matches against the top four seeds in the event. In Hermosa Beach the pair had a contender's match in which after losing the first set, they won the next set 38-36 and then won the match. Less than three hours later they duplicated the feat, winning the second set 40-38 in establishing an AVP main draw record for most points in a set. 2008: Patterson partnered with five different players on the AVP Tour, playing in the main draw in 12 of 13 events. He had a best of ninth twice, with John Moran and Canyon Ceman, both times after advancing from the qualifier. 2007: Patterson began the year with a qualifier with Larry Lentz, then played seven events with Kyle Denitz. The duo advanced from three qualifiers and placed 25th each time. 2006: Patterson played in four AVP qualifiers with three different partners. 2004: Patterson and Dennis Roberts played in three AVP events, advancing to one main draw. He and Daniel played in one qualifier. 2003: Patterson played in three AVP qualifiers with Mike Daniel, with a best of 49th. � In the 2016 Rio Olympics Patterson qualified with Jake Gibb as the number six seed. The duo went 1-2 in pool play, placing 19th. College: Patterson played at BYU, where he was chosen for a pair of all-tournament teams. He graduated with a degree in Recreational Management, then played professionally in Puerto Rico (2005, 2007, 2009) and Sweden (2006), and was the MVP of the Puerto Rican indoor league. Personal: Patterson married his wife Lexi in 2005, and they have two sons (Cash, born in June 2009, and Guy, born in May 2011) and one daughter (Ray, born in 2014).